We reprint below an August 14 leaflet issued by the Bay Area Spartacus Youth Club. 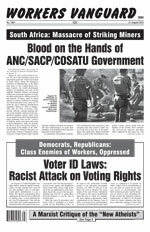 In November of last year, the world watched as University of California Davis (UCD) cops attacked a group of seated Occupy student protesters with pepper spray, treating them with the disdain of an exterminator spraying cockroaches. On March 29, eleven students and one professor, most of them victims of the November police assault, were slammed with charges that could send them to prison for nearly eleven years and result in $1 million in fines. Last January, the UCD Occupy protesters had begun a sit-in at the campus branch of U.S. Bank against the “university’s privatization” and “its collusion with corporate profiteers.” After nearly two months of sit-ins and other actions by dozens of protesters, U.S. Bank closed its branch on February 28. It dropped its $3 million deal with this public university after complaining that UCD did not dispatch campus police, or allow the bank to use its guards, to remove the protesters. Weeks after the bank closed shop the district attorney—who reportedly colluded with the same UCD cops who were involved in the November pepper-spray attack—charged the “Banker’s Dozen” with 20 counts each of “obstructing movement in a public place” and one count of “conspiracy.” Drop all the charges immediately! Cops off campus! The outrage of the students is entirely justified. Once almost free, annual tuition and fees for California residents at the University of California have more than tripled over the past ten years to over $13,000. Job prospects are dismal to say the least—according to a Rutgers University study, over 40 percent of 2010 college graduates couldn’t find employment by spring of 2011. The Spartacus Youth Clubs demand: Open admissions, no tuition and a state-paid living stipend for all! Nationalize the private universities! Abolish the student debt! Capitalist institutions like U.S. Bank are undoubtedly benefiting from the nationwide budget cuts and tuition hikes, which force students to shackle themselves to mountains of debt that will weigh them down for decades after they graduate. But it is the capitalist system as a whole, not individual banks, that is responsible for these attacks. The capitalists do not see education as a right; they see education in terms of investment vs. returns. Universities are training grounds for the administrative, technical and cultural personnel needed by the capitalist system. In general, the ruling class will spend only as much money on education as it thinks is necessary to maintain its profits. In the midst of the worst recession in decades, spending money to educate the sons and daughters of the working class and poor seems like a waste of money to these bloodsucking parasites whose tremendous wealth is based on the exploitation of the working class. An April 23 “Statement by Some Banker’s Dozen Supporters” argues that the charges against the protesters are “an abuse of the legal system and a waste of our county’s already limited resources.” But this is exactly what the legal system is for: to protect the property rights and interests of the capitalists and their banks. The bourgeois state—which consists at its core of the police, courts, prisons and military—is an instrument of capitalist rule, not a neutral arbiter standing above society. The fundamental role of the administration is to serve as the representative of the capitalist class within the universities. It is not a matter of the “over influence” of money in politics or in education; the banks don’t have to bribe UCD Chancellor Katehi to serve them any more than a fish has to be bribed to swim. The administration and the state work together to quell protest against the depredations of this brutal and decaying system. That is why Katehi gave the green light to violently clear out the protesters in November and that is why she embraces the persecution of the Banker’s Dozen, making the chilling statement on April 27 that “the students involved in this case will learn from this experience.” Abolish the administration! For worker/student/teacher control of the campuses! Many students, however, have illusions that the universities—and indeed capitalism itself—can be reformed into putting “people before profits.” These illusions can be as blinding as pepper spray and just as dangerous. While the bosses have in times of class struggle been forced to offer cheap or even free higher education, these gains are always reversible as long as the capitalist system remains intact. In diametrical opposition to Occupy’s program of liberal, bourgeois populism, the SYCs seek to win young activists to the understanding that this system cannot be reformed. It must be smashed and replaced by a workers state. The UCD protesters have shown courage and determination in the face of draconian state repression. But like all students, they have no direct relationship to the means of production and therefore no real social power. By contrast the working class—those whose labor produces and transports all of the goods and services in society—can bring the capitalist system to a grinding halt. The capitalists can send their cops to repress and terrorize the workers and students, but it is the workers whose labor keeps the factories running and the profits flowing. If students are to win their battles against the rulers’ assaults on public education, they must look to the proletariat. This struggle could find support among the workers, who are being ruthlessly squeezed in the vise of austerity. As the youth auxiliary of the Spartacist League, the SYCs fight to win youth to the program of international workers revolution, which will replace the capitalist system based on production for profit with a centrally planned, collectivized economy. In such a system the resources of society will be rationally directed to provide for the needs of humanity, including universal employment and free, quality, racially integrated education for all. To do this, the efforts of workers and their student allies require the leadership of a revolutionary proletarian party, which is what we Marxists seek to build. Defend the Banker’s Dozen! Drop all the charges! The next court hearing is currently scheduled for August 24 at the Yolo County Courthouse, 725 Court Street, Woodland, CA. To contribute to their legal fund, visit: davisdozen.org. Send protest letters to: District Attorney Jeff W. Reisig, 301 Second St., Woodland, CA 95695, fax (530) 666-8423.